A sudden wave of snow caused major whiteouts across a large swath of southern Ontario Thursday morning, leading to a massive multi-vehicle pileup on Highway 400 south of Barrie. The chain-reaction crash occurred as drivers found themselves blinded in slippery conditions when a snow squall moved in from Lake Huron and Georgian Bay. 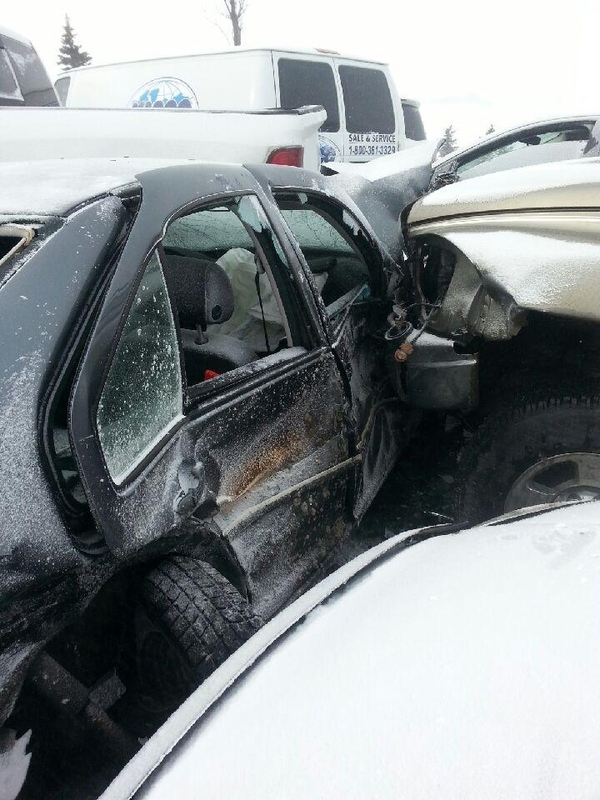 Nearly 100 cars were involved in a chain-reaction collision near Barrie on Thursday, Feb. 27, 2014. 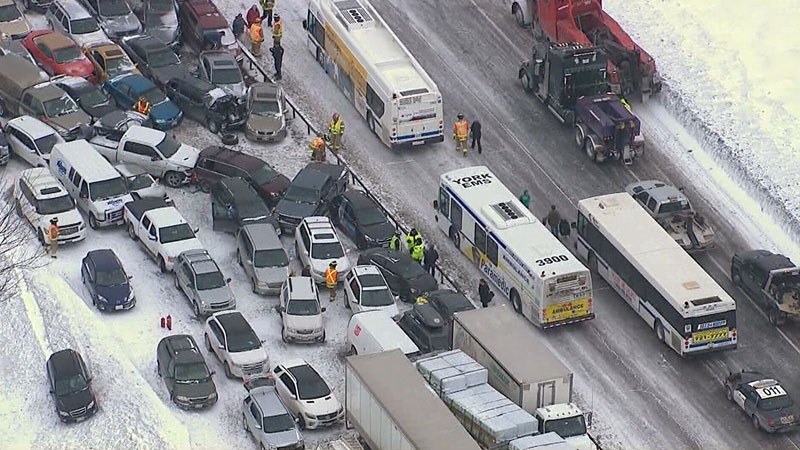 An aerial view of a major pileup on Highway 400 near Barrie can be seen in this photo taken from the CTV News chopper. 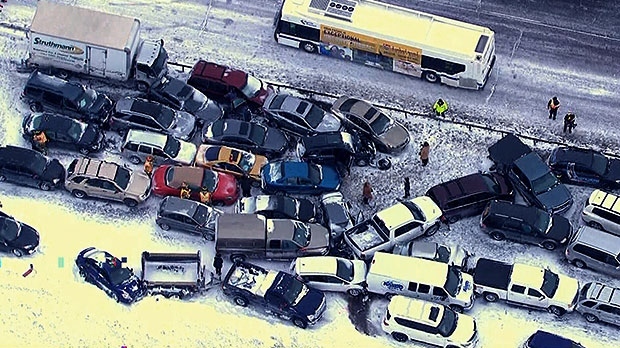 An aerial view shows a 96-vehicle pileup on highway 400, Thursday, Feb. 27, 2014. 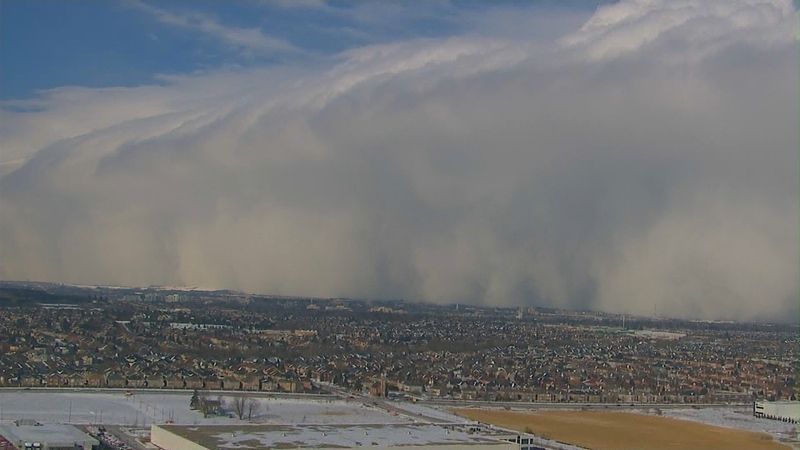 A snow squall moves north of Toronto on Thursday, Feb. 27, 2014. 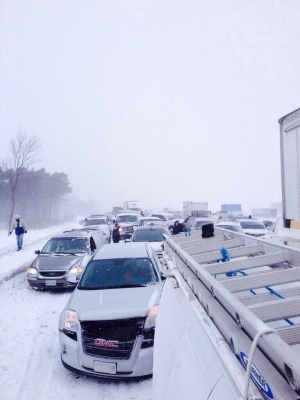 During the whiteout conditions, 96 vehicles were involved in the Highway 400 pileup, OPP Const. Dave Woodford told CP24. Three people were taken to hospital and treated for non-life threatening injuries. By 8 p.m. Thursday, the stretch of highway had been reopened. Snow plow operator John Corner, who drove through the storm, told CP24 the "wall of snow" limited visibility to just a few metres. "It's probably the worst I've seen all winter long," Corner said. Latest forecast: Are more squalls coming to GTA? Firefighters, paramedics and police officers set up a triage area on scene to assess anyone with injuries. The crash created a virtual scrap yard of the stretch of southbound highway between Innisfil Beach Road and Mapleview Drive, and police expect it will remain closed for most of the day. Northbound lanes are closed from Highway 89 to Mapleview Drive. Transport trucks sandwiched smaller vehicles, and some cars appeared to be cut in half. Police estimate it will take hours to remove all the twisted metal and wreckage from the snow-covered road. Each vehicle removed has been numbered and towed to a horse paddock at Georgian Downs, where police have set up a collision reporting centre. Transit buses were brought in to keep crash victims warm. 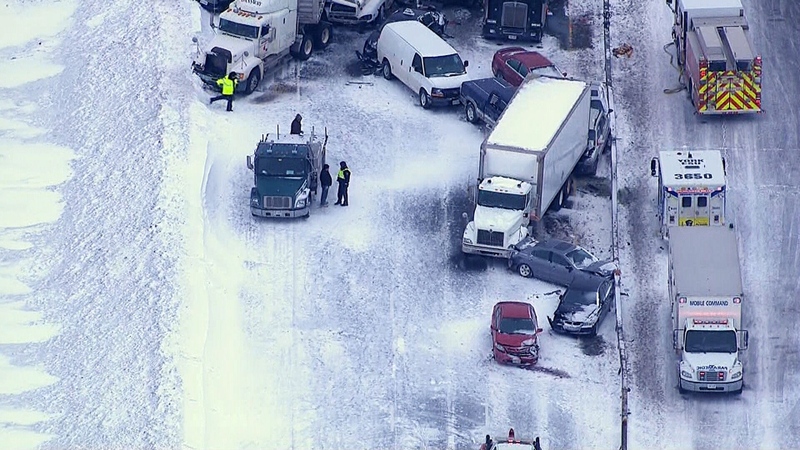 Seven vehicles were involved in a crash near Stouffville, Ont. on Thursday afternoon, police said. The pileup happened near Highway 48 and Stouffville Road, OPP Const. Dave Woodward told CTV Toronto. Two of the drivers were transported to hospital, one with life-threatening and the other with non-life-threatening injuries. All lanes of Highway 48 have been shut down south of Stouffville Road as an OPP reconstruction unit investigates the cause of the collision. Anyone with information regardling the collision is asked to call the Aurora OPP detachment at 905-841-5777 . 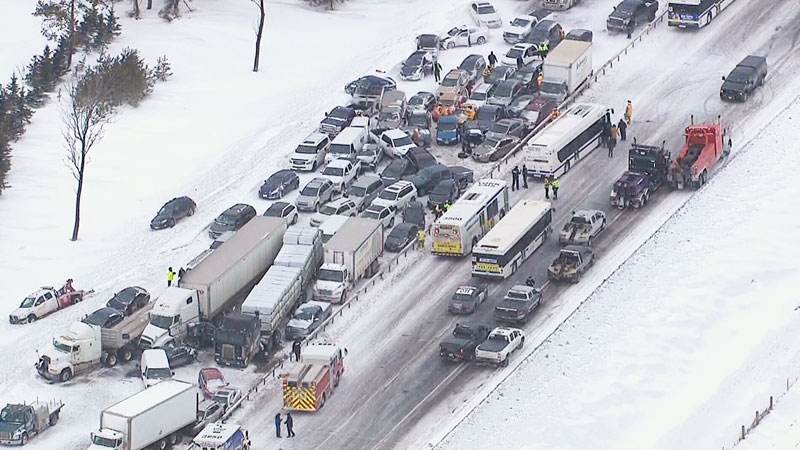 The pileup near Barrie is just one of the accidents and closures reported across the region, as drivers encountered similar conditions from Kitchener in the west to Port Perry in the east. Multi-vehicle crashes were also reported on Highway 89 between Cookstown and Alliston and at Highway 89 and Yonge Street. The Highway 7A causeway was closed between Island Road and Water Street east of Port Perry, but opened shortly after 3 p.m. 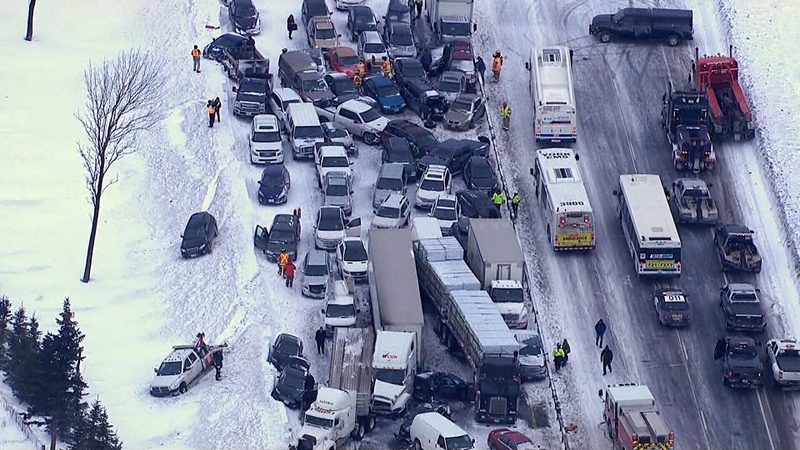 The Port Perry crash involved 29 vehicles, and at least eight people were transported to hospital with minor injuries, Durham EMS told CTV Toronto.